The opening of St Francis House (a Catholic Worker House) in 1993 on the Cowley Road provided a welcoming venue for members of the community. Volunteers from local (and not so local) churches, as well as members of the local community, eat, pray and help out with the Catholic Worker Community. Currently the house is home to three asylum seekers who receive no state support. You can find out more information about St Francis House here. The Good Friday Cowley Road ecumenical Stations of the Cross emerged from a St Francis House initiative. The event is preceded by a Service at the Methodist Church and ends with conversation and hot cross buns at SS Mary and John’s Church. This outdoor shared church witness along the Cowley Road reflects on the needs of our vulnerable brothers and sisters in the challenging light of the Gospel. The Good Friday stations of the cross has become annual since its inception nearly two decades ago. "To celebrate the Week of Prayer for Christian Unity, seven churches in East Oxford organised a visiting chain of parishioners. A couple from St Clement’s visited SS Mary and John, one of our neighbouring Anglican parishes and, in return, received guests from Greyfriars. In the evening, all the visitors gathered at St Clement’s for refreshments and a chat about the experiences enjoyed in the morning followed by a united Taize service. 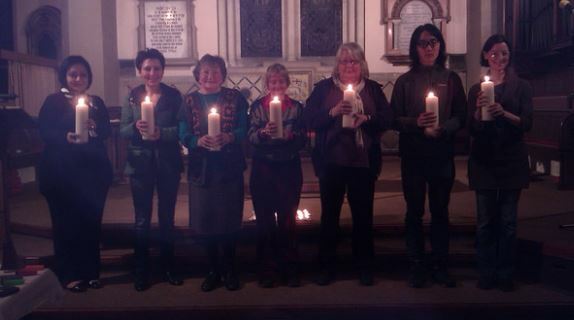 To the right is a photo of the end of the service – seven candles and seven people for the seven churches involved. There will be plenty of further opportunities for churches to work together this year, both formal and informal thanks to links that come from cross-congregational friendships." The article has been adapted from a piece, originally written by Wulf of St Clement’s Church. You can find the original as well as further information here.